Our ocean loving beach community will be celebrating Earth Day at the Free Our Seas Environmental Art Festival on April 20. At WMODA we have been exploring the wonders of the deep in our recent Highlights posts to create greater awareness of our marine life. 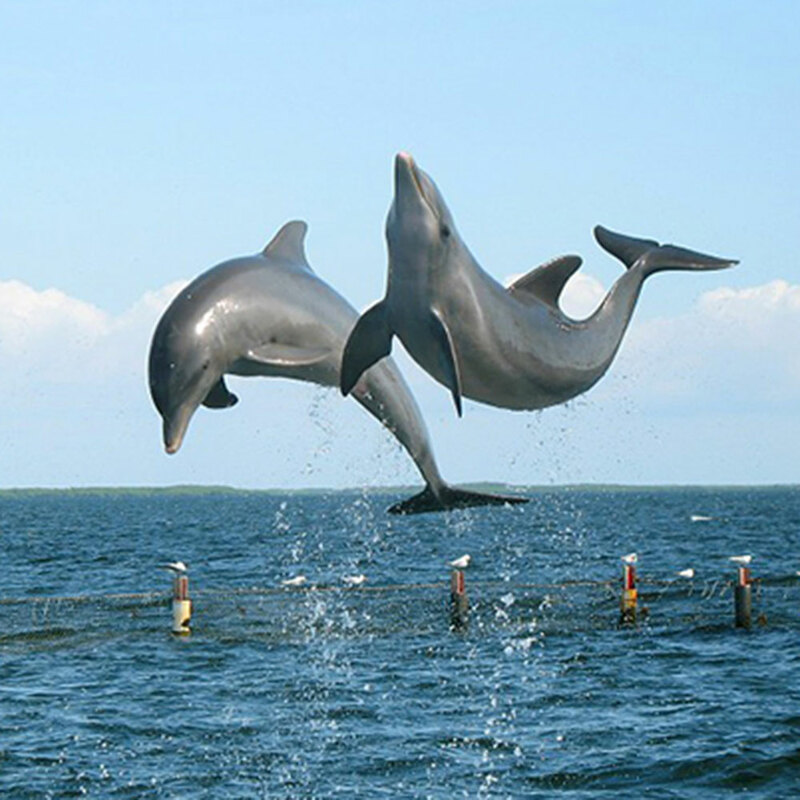 Dolphins are a familiar sight frolicking in the waters of South Florida and the more adventurous tourists enjoy swimming with dolphins. 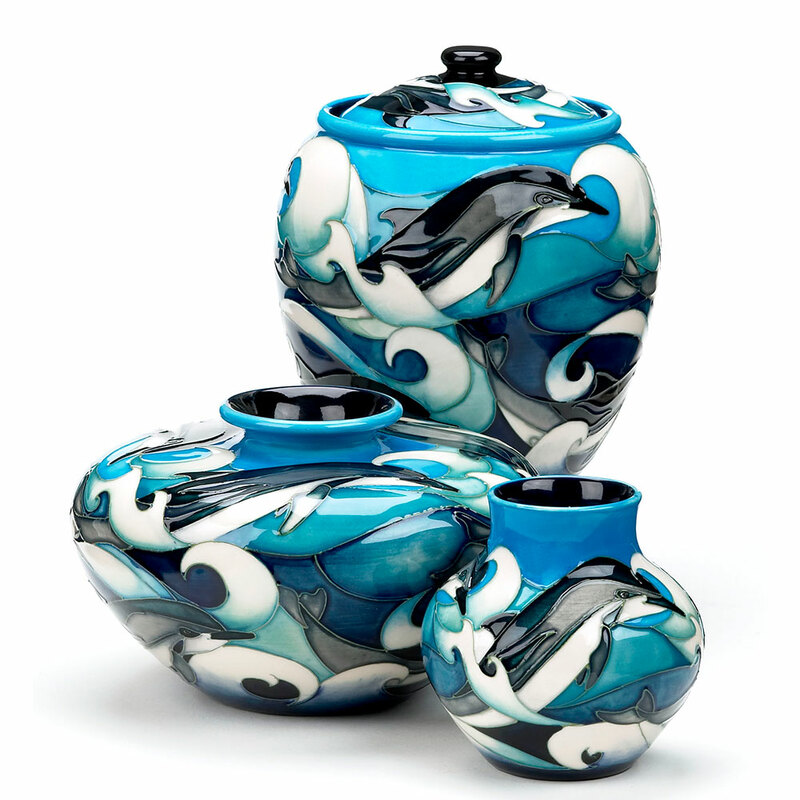 Tales of dolphins befriending humans reach far back into history and have inspired many stunning examples of ceramic and glass art at WMODA. 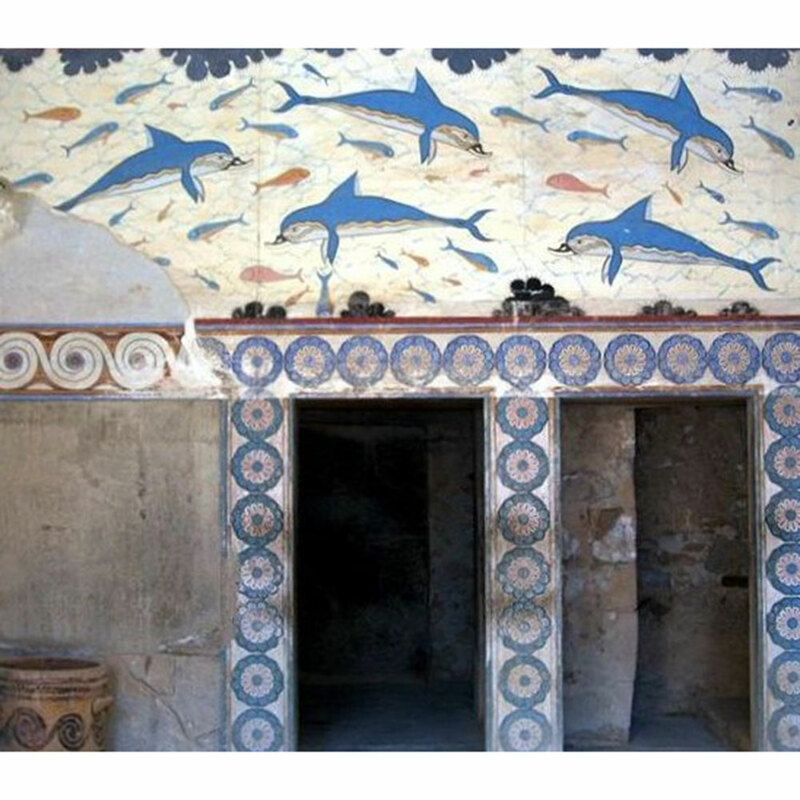 Aristotle wrote about dolphins “passionate attachment to boys” and Pliny the Elder recounted the story of a dolphin named Simo who gave rides to a young boy in AD77. 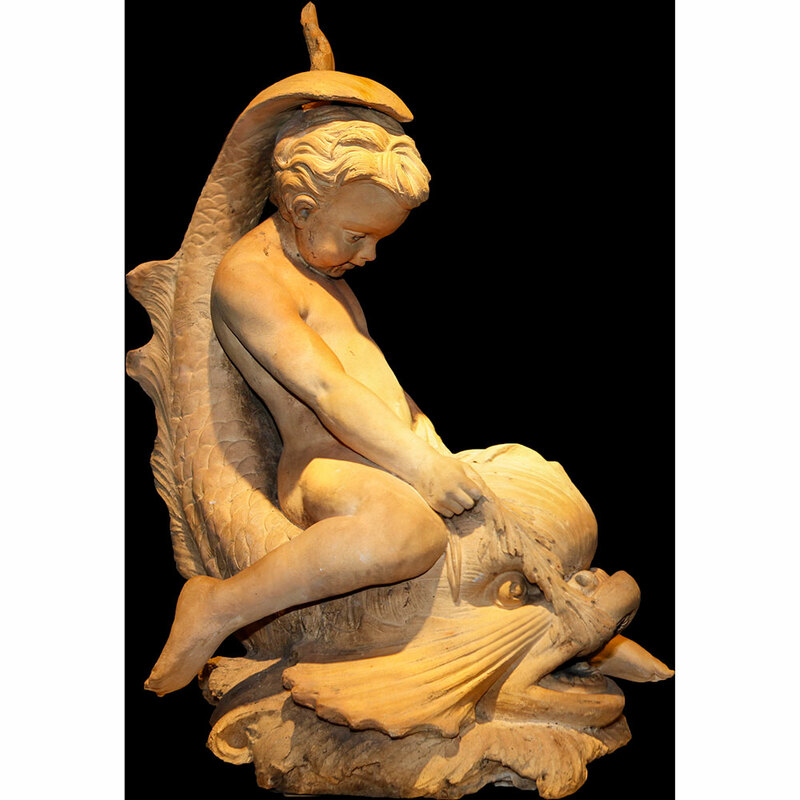 The dolphin carried the boy on its back across a lake to go to school each day and when the boy died the dolphin grieved itself to death. 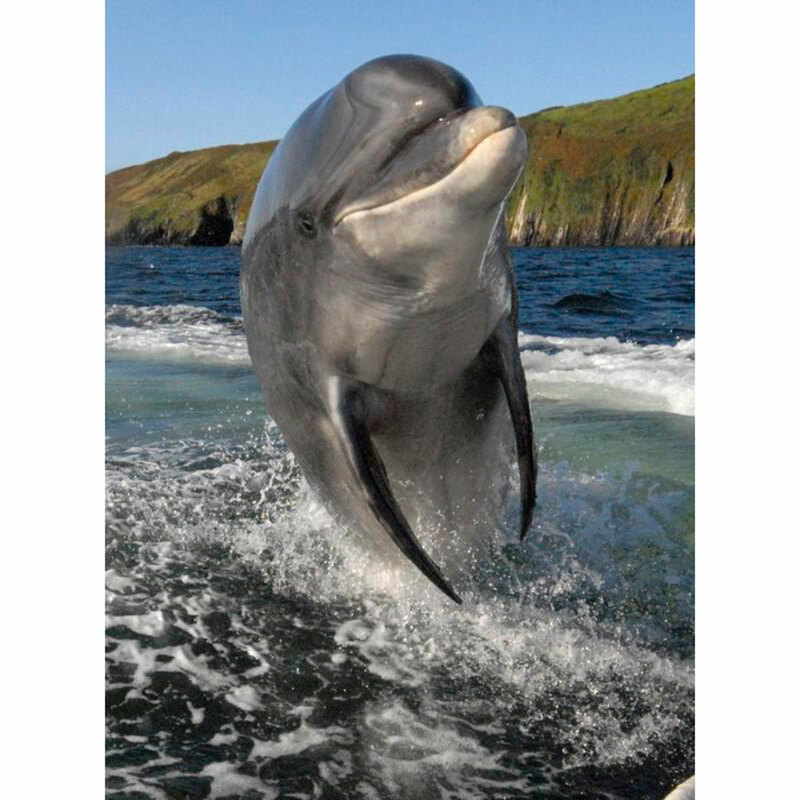 In recent times, Fungie, a bottlenose dolphin that lives off the Dingle Peninsula in Ireland, has been cited as the most loyal animal on the planet. It is rare for wild dolphins to seek out human contact but Fungie, the Dingle Dolphin, was first spotted in the harbor in 1983 and has interacted playfully with swimmers, surfers and divers for over 30 years. 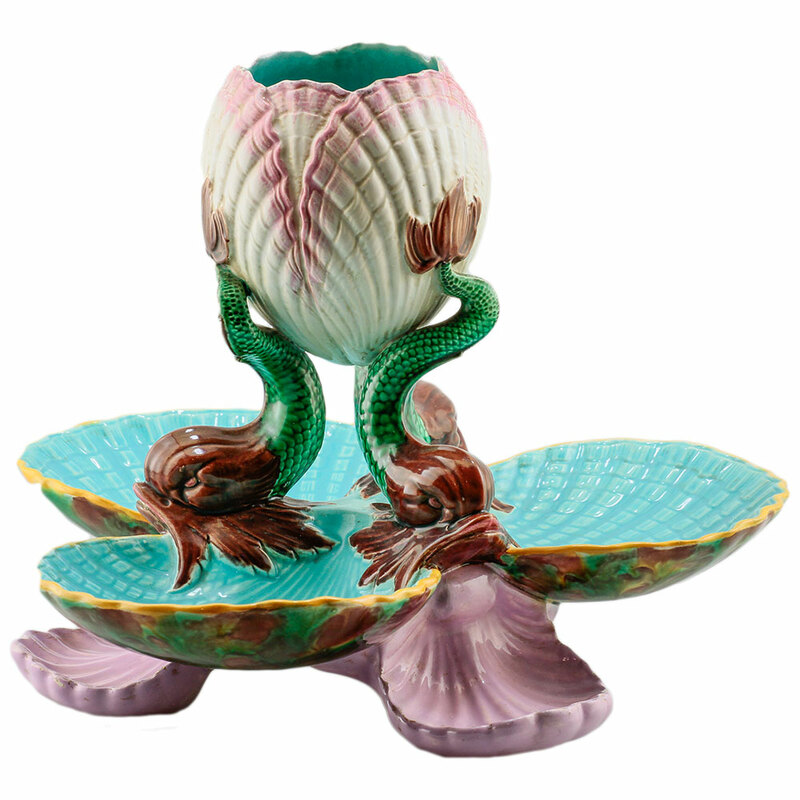 Dolphins represent affection and have long been associated with Cupid, the god of love. 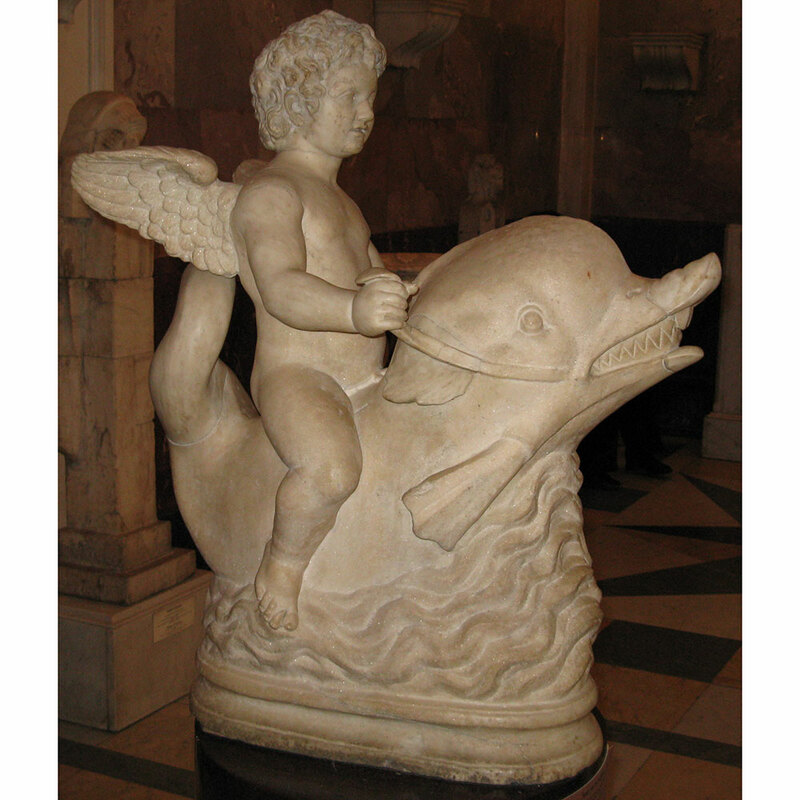 The son of Venus is often shown riding a dolphin symbolizing his mother’s origins in the sea. 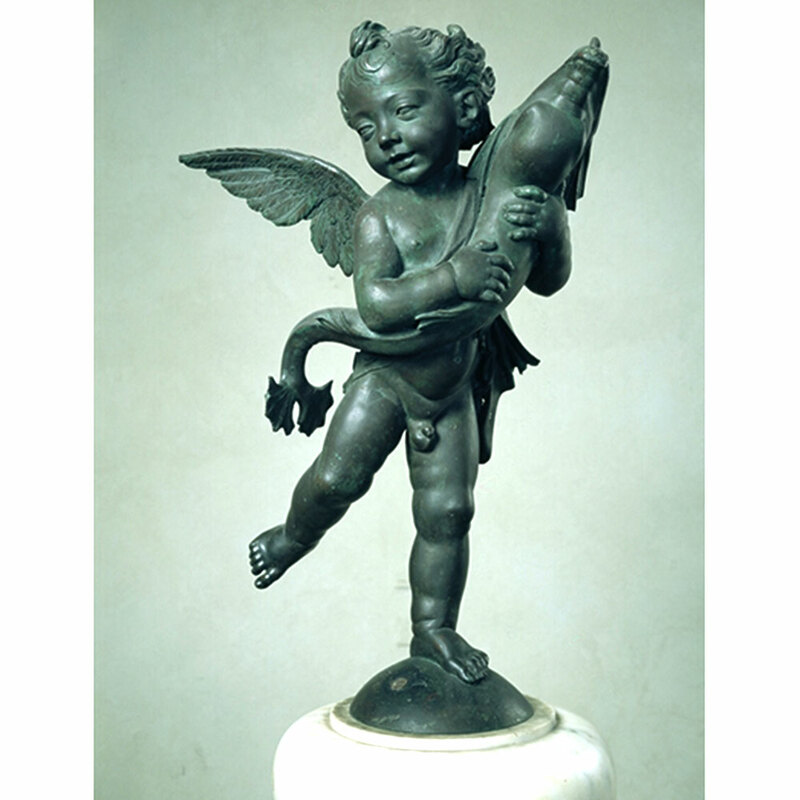 Cupid on a dolphin became a playful subject for fountains and garden statuary. 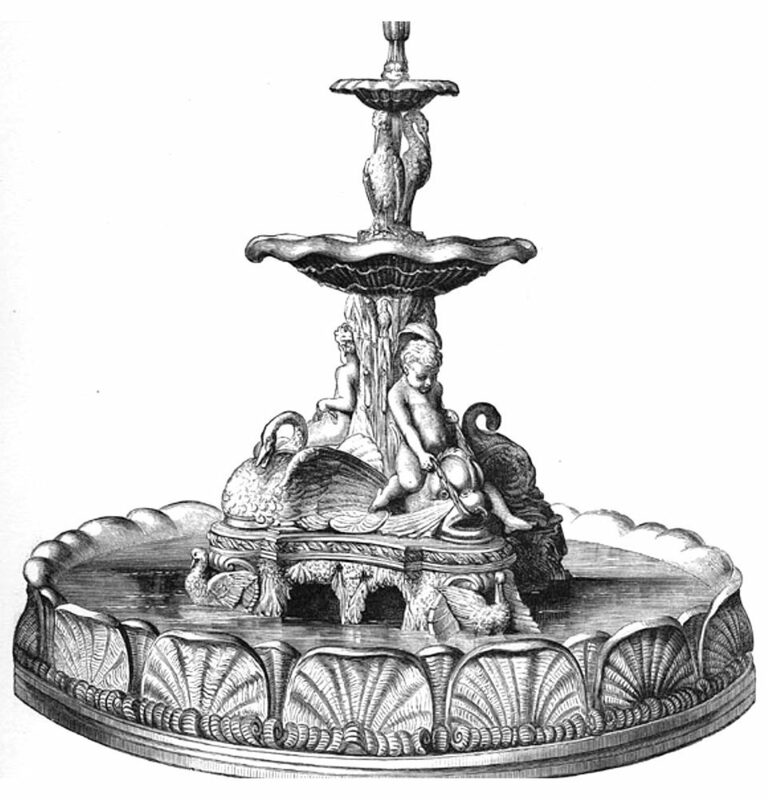 The dolphin is often elaborated fantastically and sometimes used as a fountain water spout. 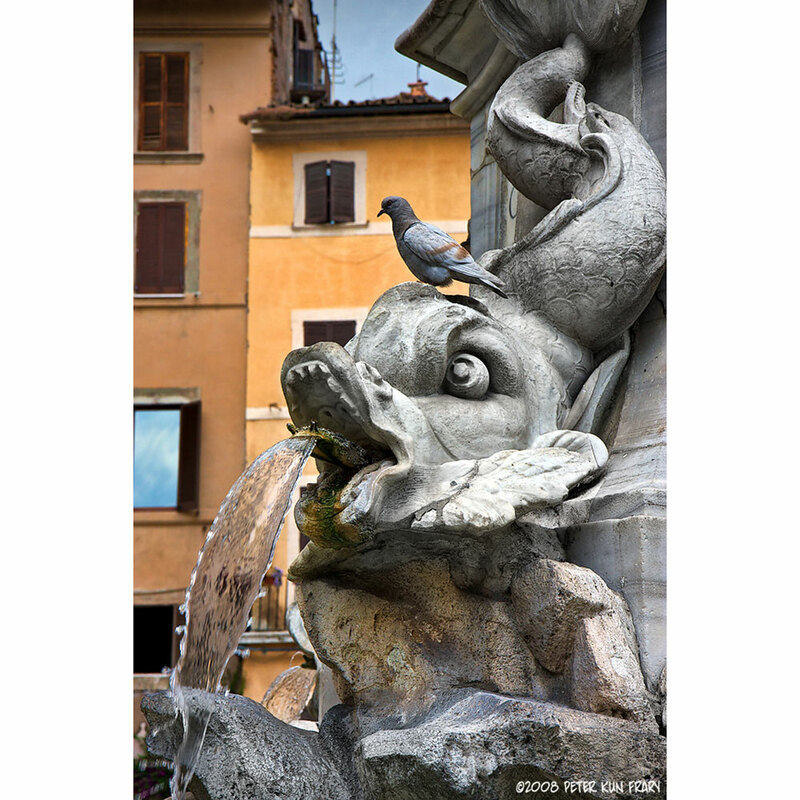 A dolphin-riding Cupid often attends the wedding of Neptune and Amphitrite. 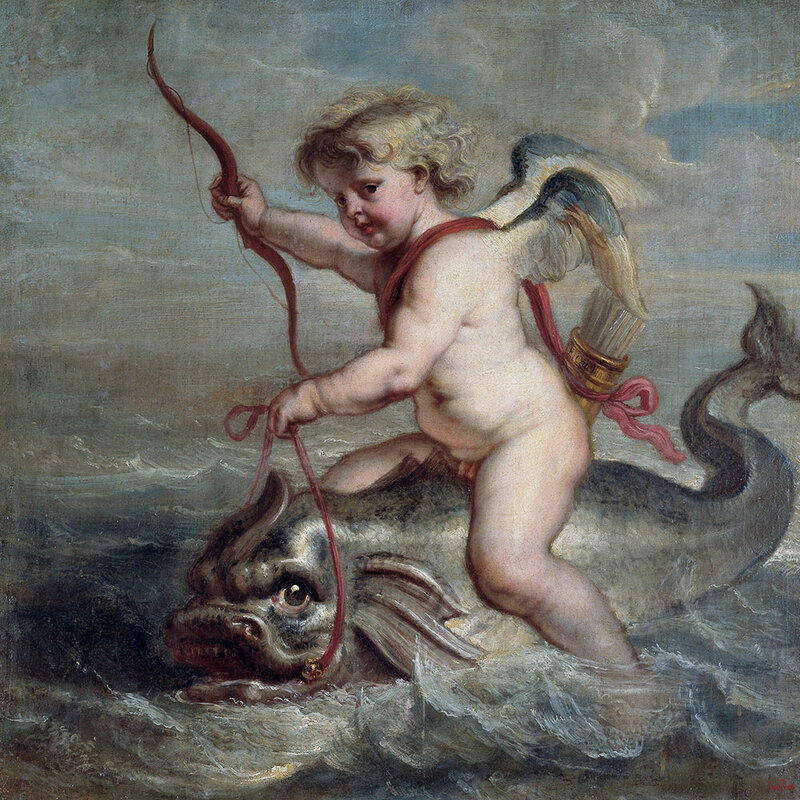 Cupid astride a sea beast may also represent the swift, wild ride of love. 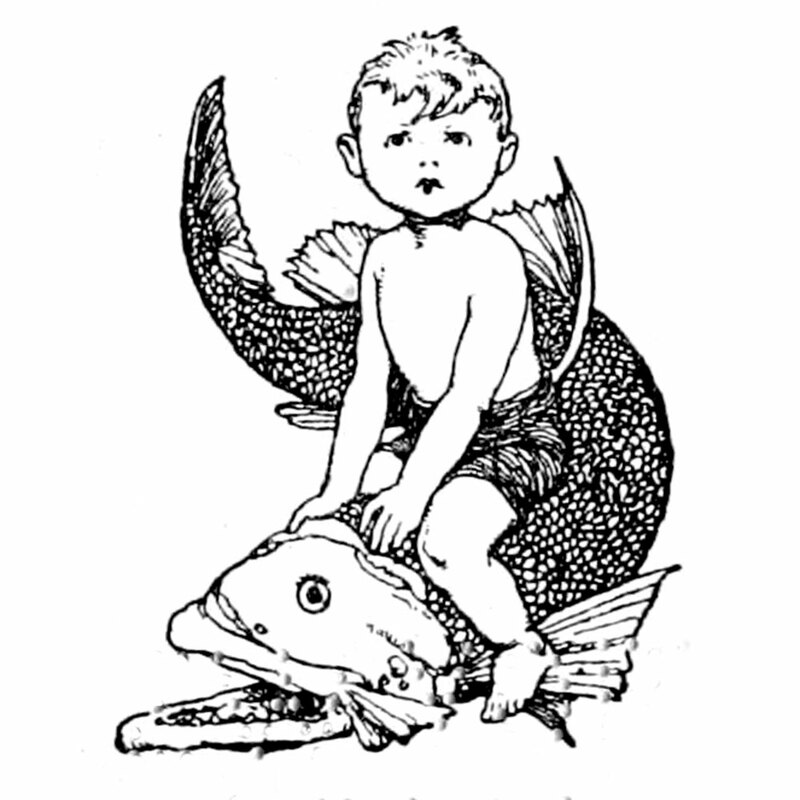 In Greek mythology, Palaemon was a young boy who became a sea god after his mother jumped off a cliff with him to escape all the madness on earth. 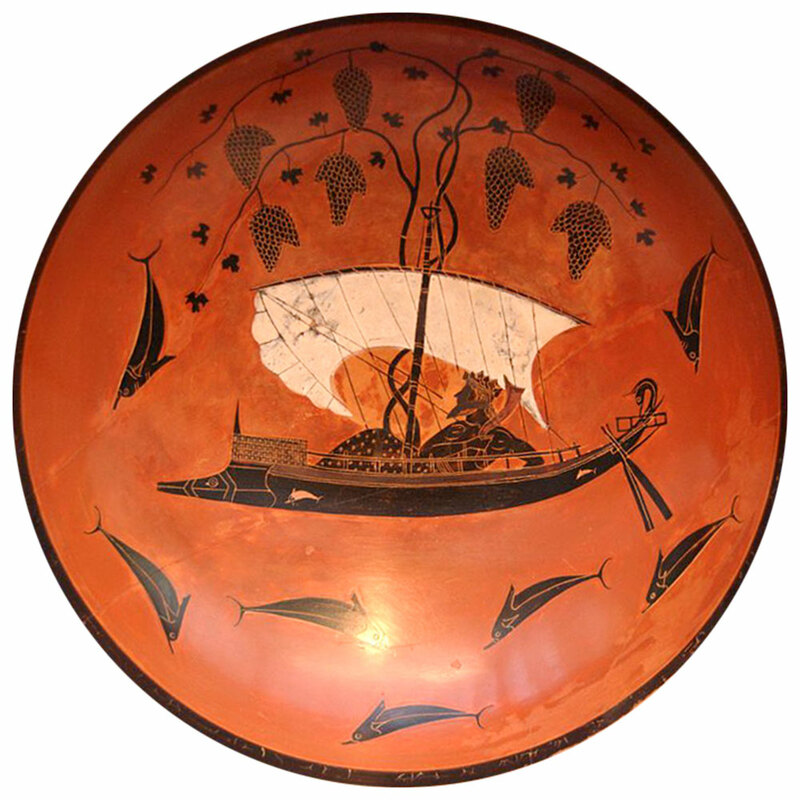 Palaemon and his mother helped distressed sailors on voyages and in Roman times he became the god of the harbor. 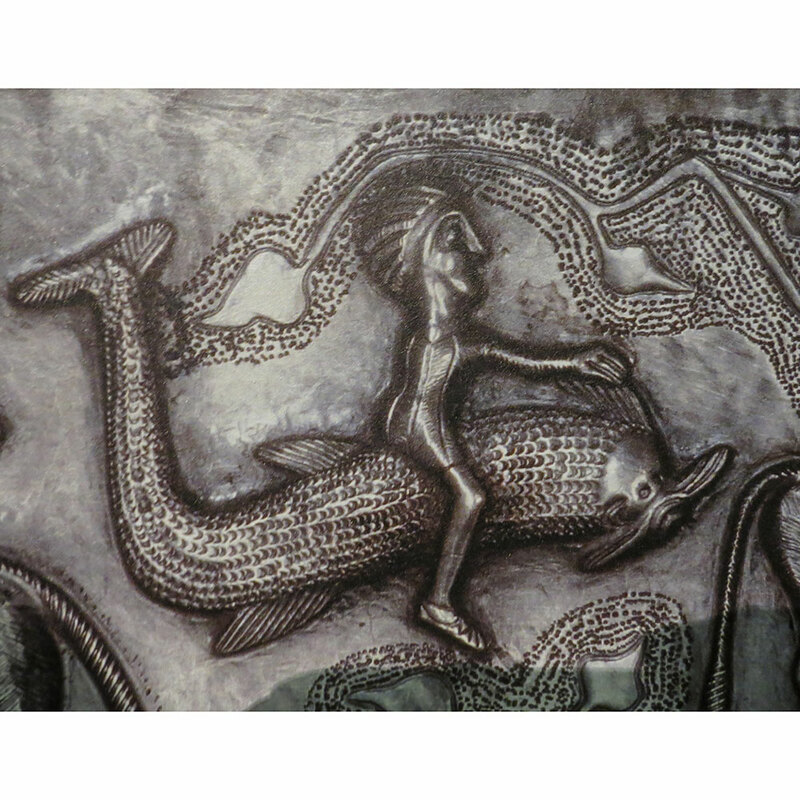 In Greco-Roman art, Palaemon is sometimes depicted as a dolphin-riding boy. 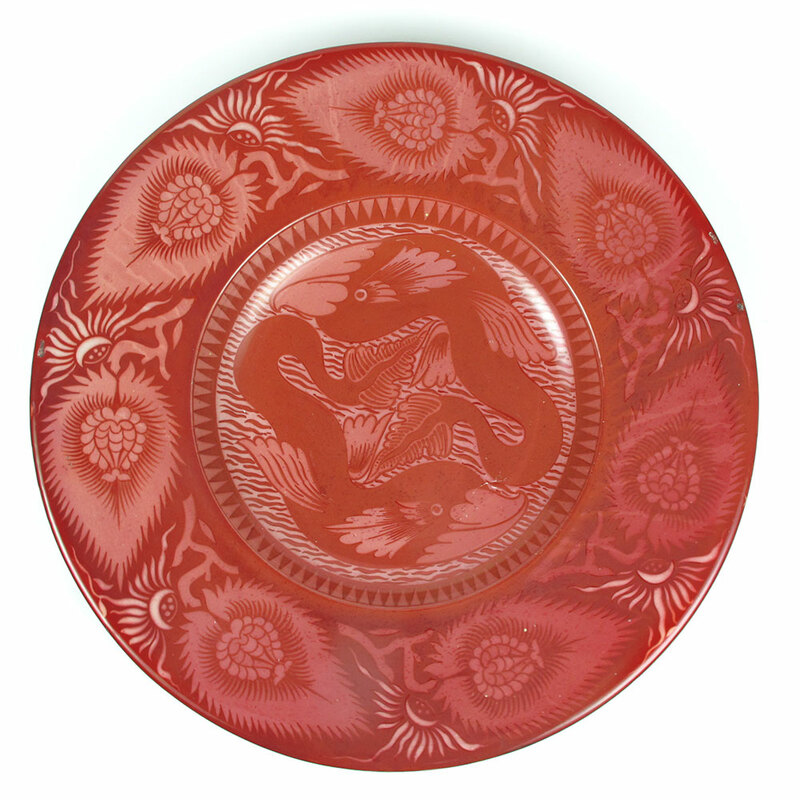 Many 19th century potters were influenced by images of dolphins from Classical art. 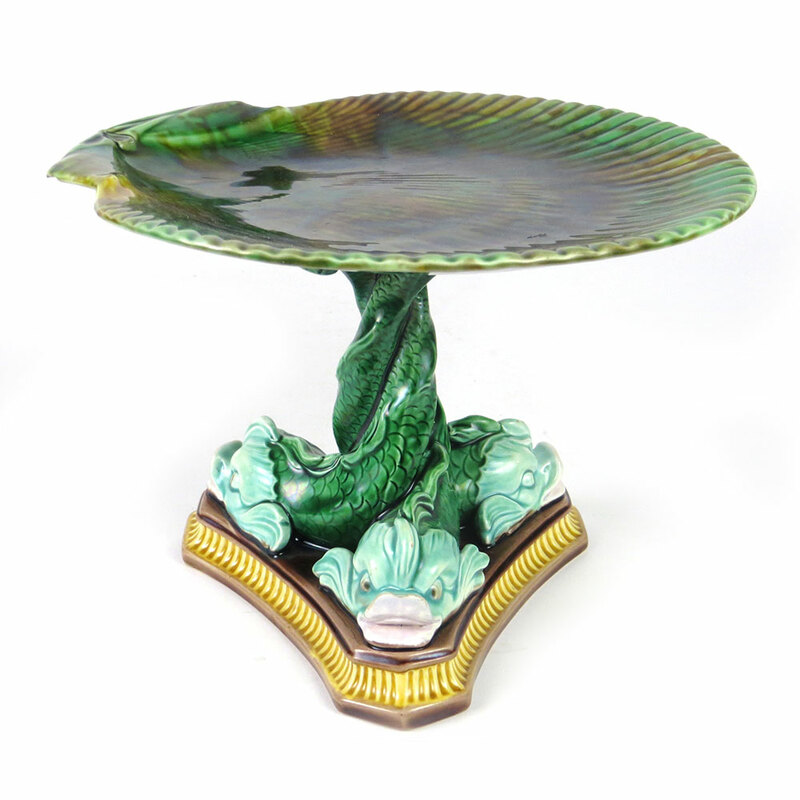 Victorian Majolica ware abounds with chubby children playing with dolphins and sometimes riding on them. 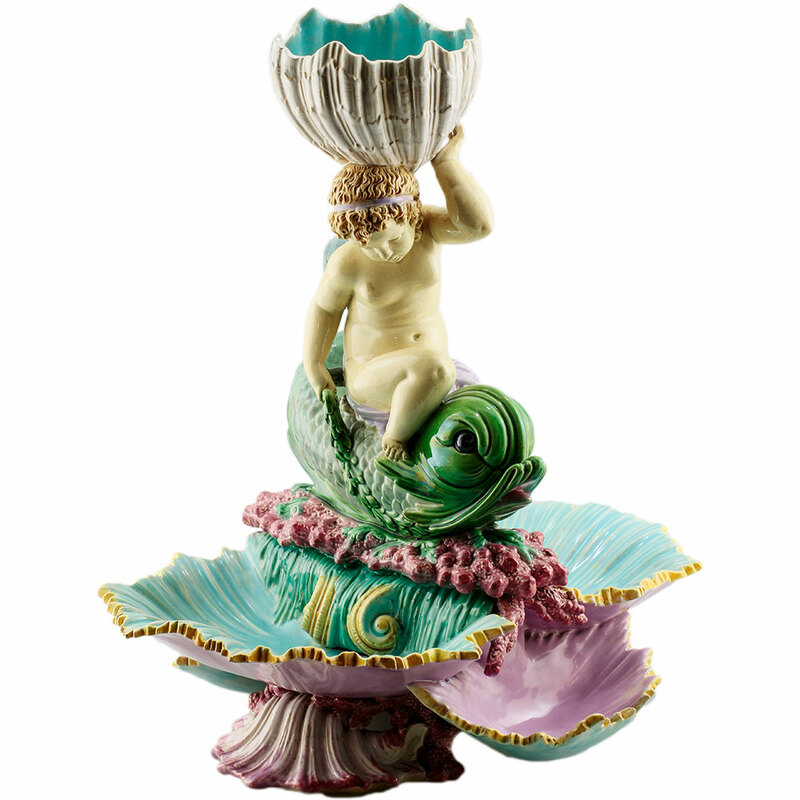 George Tinworth, the first artist at Doulton’s Lambeth Pottery, modeled several terracotta sculptures of dolphins with little cupids, who are usually wingless. 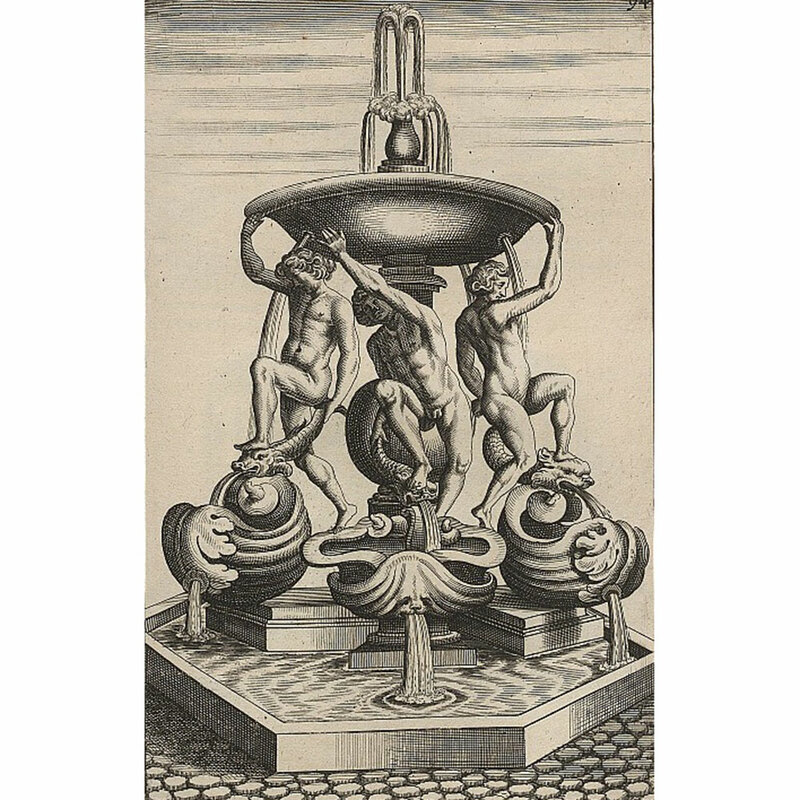 They were conceived as part of a playing fountain design in the style of the Renaissance. 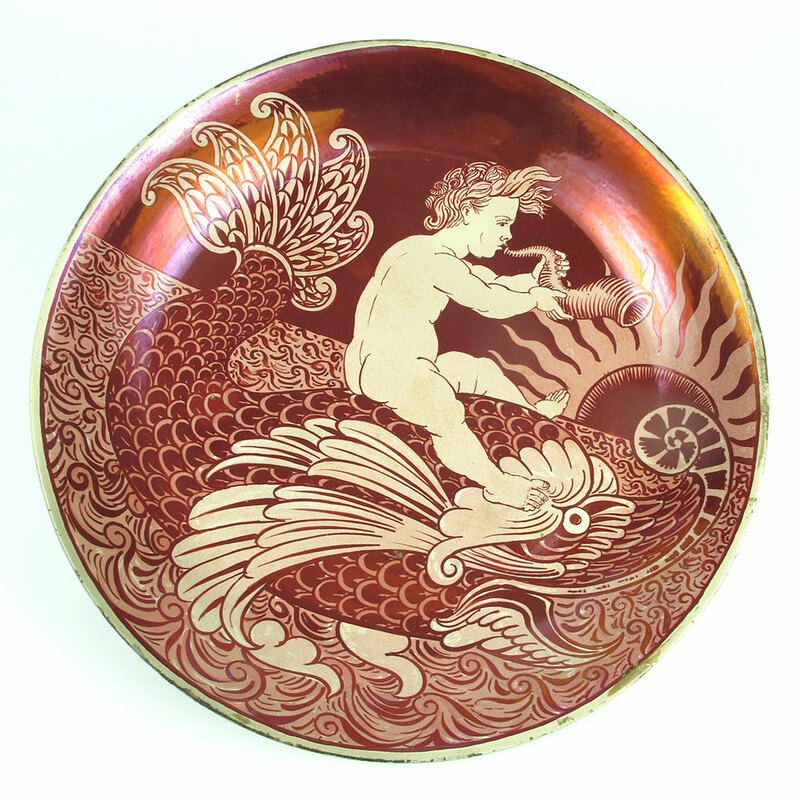 The Victorian artist-potter, William de Morgan created lustrous designs with dolphins and children, two of which can be seen in our Fantastique exhibit. 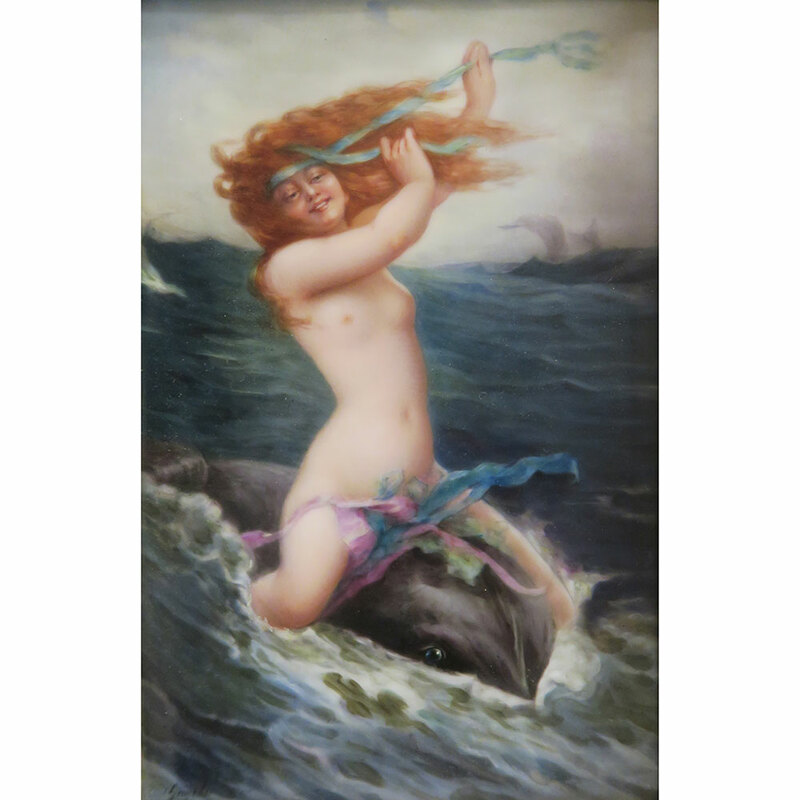 Sea nymphs and nereids are also found riding dolphins and WMODA features a striking porcelain plaque and an Art Deco sculpture by Goldscheider. 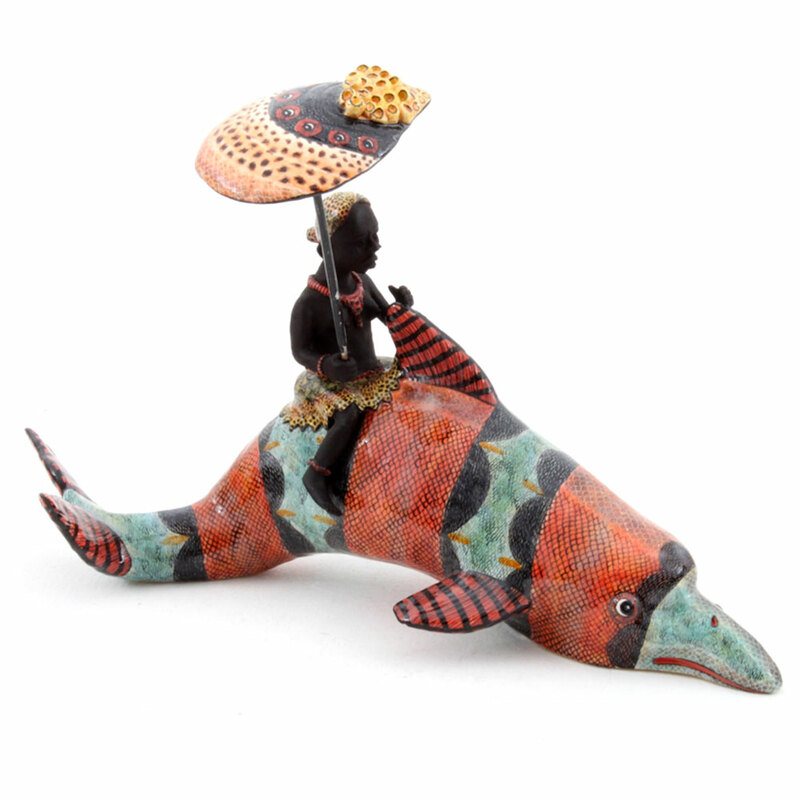 In more recent times, Ardmore Ceramics in South Africa have fantasized about Zulus riding on various sea creatures, including fish, whales and dolphins. 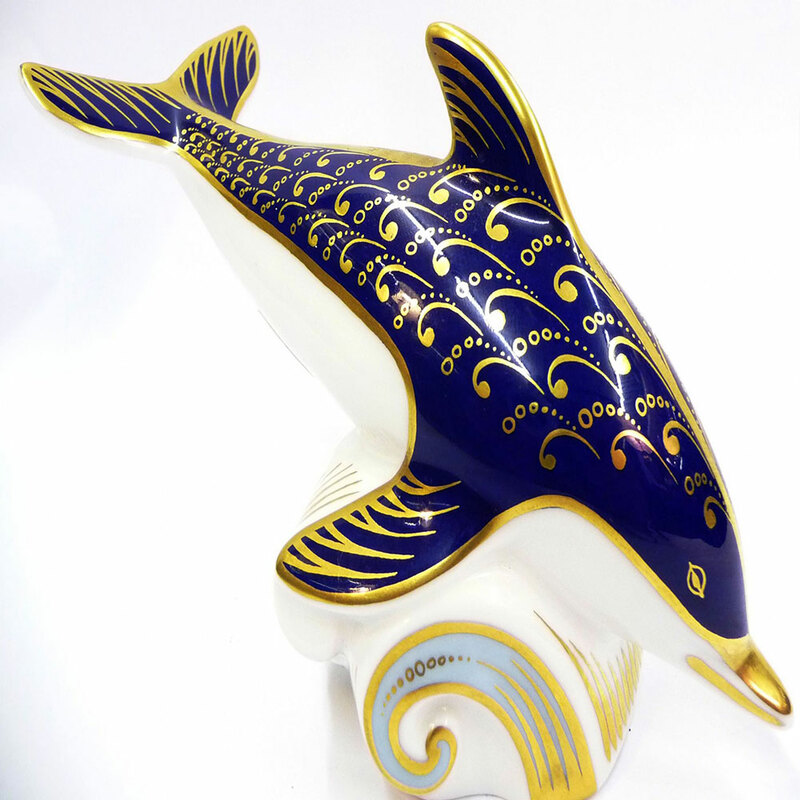 Sian Leeper at the Moorcroft Pottery produced a series of dolphin vases inspired by the mosaics at Knossos in Crete and Royal Crown Derby have made sleek, stylized dolphins into paperweights. 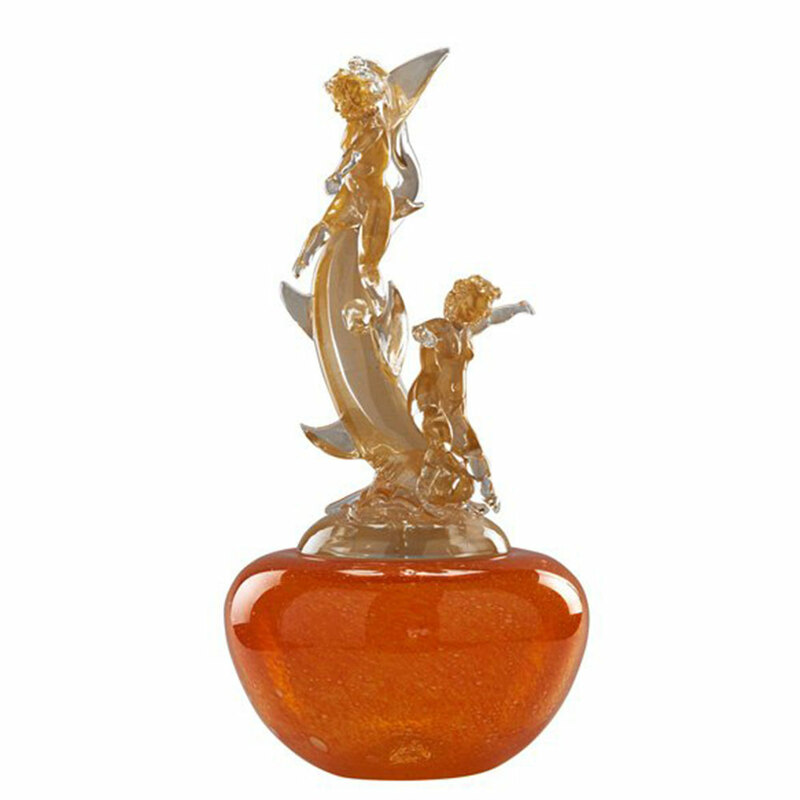 In glass, Pino Signoretto has sculpted putti riding dolphins and other sea creatures during his collaborations with Chihuly. 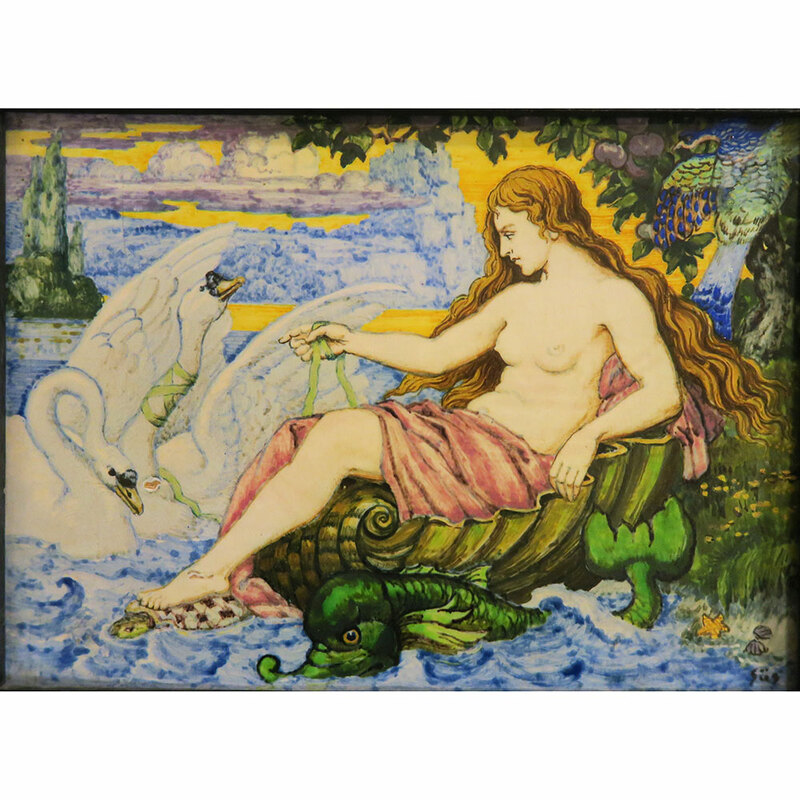 The myth of Arion being saved by a dolphin has also inspired countless paintings and sculptures as can be seen in our Highlights article for National Poetry Month.